For more than 130 years dinosaurs have been classified into two distinct orders, the saurischians and the ornithischians. But as it is common in biological sciences, every theory is true until the opposite is proved. A new study has called into question classical dinosaur classification, destroying and redistributing some of the different dinosaur groups. Even if this new hypothesis isn’t 100% sure yet, in this entry we’ll explain what this dinosaur reordering consists in. Since the XIX century, dinosaurs have been divided into two large orders based on their hip anatomy. The order Saurischia (lizard-hipped) includes theropods (carnivorous dinosaurs and current birds) and sauropodomorphs (large, long-necked herbivores); the order Ornithischia (bird-hipped) includes ornithopods (herbivorous and duck-billed dinosaurs), marginocephalians (dinosaurs with horns and hardened skulls) and thyreophorans (armored dinosaurs). Traditional dinosaur evolutionary tree by Zureks, with the two different hip morphologies at the bottom. Yet, this classification doesn’t have the last word. Palaeontology is an extremely volatile science, as with each new discovery, you can dismantle everything you knew at that moment, even if it’s a centenary-old hypothesis. This is what has recently happened with dinosaurs. It includes a larger number of species and taxons (many more than in previous investigations). Previous studies gave more importance to basal theropod and sauropodomorph dinosaurs (traditional saurischians), as they were the first dinosaurs to diversify, including few basal ornithischians. It has also included many dinosauromorph archosaurs (non-dinosaur taxons). Older studies had assumed many ornithischian characters to be symplesiomorphies (ancestral characters of all dinosaurs) and they only focused on a few synapomorphies (characters found in a monophyletic group). This study has detached from many of the previous assumptions on dinosaur phylogeny and has analysed a large number of species and many characters not included in previous investigations. This has made the resulting evolutionary tree pretty different from the ones obtained before. Order Saurischia which, according to this study, only includes sauropodomorphs and herrerasaurids (a group of carnivorous, non-theropod saurischians). The new order Ornithoscelida (bird-limbed) that includes the traditional ornithischians and theropods, which are no longer saurischians. Keeping this in mind, let’s now see the characteristics that define these two orders. The order Saurischia is almost the same, except that theropods are no longer part of this group. This order presents the original saurischian hip structure, which the dinosaurs’ ancestors also had. According to this new hypothesis, herrerasaurids and sauropodomorphs are all included as saurischians. Herrerasaurids (Herrerasauridae family) were a small group of basal saurischians that evolved towards meat-eating. That’s why for a long time it was thought that they were the sister-taxon of theropods, but it was later seen that they were found among the first saurischians. Even if they were pretty specialized, they were probably displaced by competition with other predators, appearing during the middle Triassic and becoming extinct at the end of it. Photo by Brian Smith of a Herrerasaurus skeleton and model, from the Field Museum of Natural History of Chicago. Herrerasaurids occupied a similar ecological niche as theropods. The new hypothesis implies that hypercarnivory (feeding exclusively on meat) evolved independently twice in dinosaurs, which makes some palaeontologist question it. Yet the herrerasaurid and theropod anatomy differed in some aspects, such as the anatomy of their hands (more generalistic in herrerasaurids) and the jaw structure. The first sauropodomorphs were biped animals just like herrerasaurids, even if they were omnivorous. Yet, sauropodomorphs would end up becoming huge herbivorous quadrupeds with characteristic long necks. 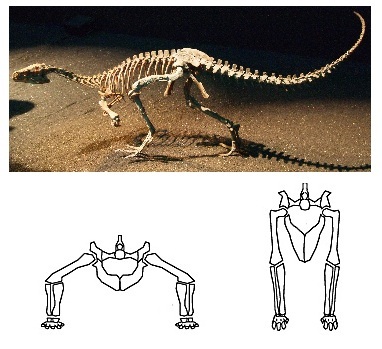 Thecodontosaurus skeleton (by Qilong), a basal sauropodomorph and a reconstruction of Plateosaurus (from Walters, Senter & Robins) a more advanced one. Even if it cannot be appreciated in this image, sauropodomorphs would increase very their size very much during their evolution (Thecodontosaurus 2 metres, Plateosaurus up to 10 metres). The new dinosaur order is Ornithoscelida, which groups theropods with ornithischians. This taxon is supported by more than twenty skeletal synapomorphies (derived characters shared by a clade), present both in basal theropods and ornithischians. Some of these characteristics include the presence of a gap between premaxillar and maxillar teeth (diastema) and the fusion of the ends of the tibia and the fibula into a tibiotarsus (even if these characteristics are only found on the most basal species). Scheme from Baron et al. (2017) of the skulls of two basal ornithoscelidans, Eoraptor (a theropod, top) and Heterodontosaurus (an ornithischian, bottom). Both theropods and the first ornithischians were bipedal animals. Also, the presence of heterodont teeth in the ancestral members of both groups leads us to think that the first ornithoscelidans were omnivorous, which would later specialise in feeding on meat and on plants (theropods and ornithopods respectively). Reconstruction of the face of Daemonosaurus, one of the first theropods, by DeadMonkey8984. A curiosity about the new classification is that accepting Ornithoscelida as a valid taxon, all feathered dinosaurs are put together into one group. Everyone knows that many theropods presented feathers (as they were the ancestors of birds) but, what most people don’t know is that feathers have also been found in some basal ornithischians and in more advanced ones too. Reconstruction by Tom Parker of Kulindadromeus, a ornithischian which feathers have been proved to be present on most of its body. Then, is this hypothesis irrevocable? Well, no of course. Even if it’s pretty tempting to assume that the dinosaur’s natural history has been changed, we cannot say that from now on dinosaurs will be classified this way. 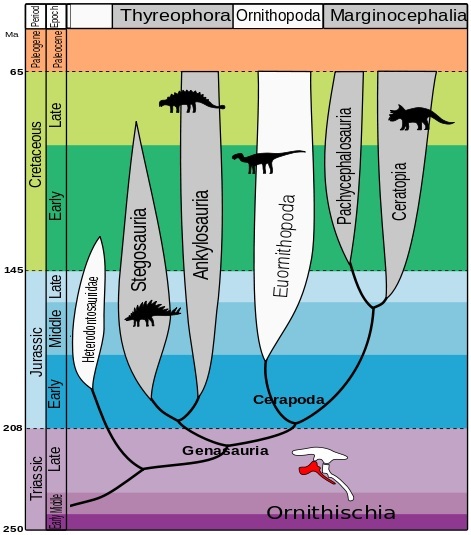 Dinosaur evolutionary tree according to Baron et al. (2017), in which we can see the different clades; Dinosauria (A), Saurischia (B) and Ornithoscelida (C). Even if this study shows really interesting results about the origin of dinosaurs, we cannot dismiss hundreds of previous studies about this group of animals. We’ll have to remain alert to new articles that step by step will keep unveiling more information about the relationships between these Mesozoic reptiles. And that’s what’s so stimulating about biology, that there’s nothing sure! And that with new investigation techniques and new discoveries, little by little we learn more about the world around us. Keep your mind open and keep investigating! G. Seeley (1887). On the Classification of the Fossil Animals Commonly Named Dinosauria. Proceedings of the Royal Society of London Vol. 43. Pp 165-171. Baron, Norman & Barret (2017). A new hypothesis of dinosaur relationships and early dinosaur evolution. Nature Vol. 543. Pp 501-506. Senter & Robins (2015). Resting Orientations of Dinosaur Scapulae and Forelimbs: A Numerical Analysis, with Implications for Reconstructions and Museum Mounts. Plos One. Scientific American. Ornithoscelida Rises: A New Family Tree for Dinosaurs. Cover image by Charles Knight. Turtles are charming animals yet, while they look cute to most people, they’ve been racking the brains of palaeontologists for decades. The combination of apparently primitive features and an extremely specialized anatomy, has made the reconstruction of the origin and evolution of these reptiles a nearly impossible task. In this entry we’ll try to get a general idea about the evolution of one of the most striking characteristics of turtles (the shell) with only four examples of primitive “turtles”. As we explained in an earlier entry, the origin of turtles is still debated among the scientific community. Turtles show some anatomic characteristics not found among any current vertebrate, which makes their phylogenetic origin confusing. One of the characteristics that has puzzled palaeontologist more is their skull. Skull of a loggerhead sea turtle (Caretta caretta) in which we can see the lack of temporal openings. Photo by David Stang. While the rest of reptiles are diapsid (they present a pair of temporal openings at each side of the skull), turtles present a typically anapsid cranium (without any temporal openings). Yet, recent genomic studies have proved that it’s more likely that testudines (order Testudines, current turtles) descend from a diapsid ancestor and that through their evolution they reverted back to the primitive anapsid form. What is not so clear is if turtles are more closely related to lepidosaurs (lizards, snakes and tuataras) or to archosaurs (crocodiles and birds). The most accepted hypothesis is the second one. Even if the origins of the testudines are still somewhat mysterious, most palaeontologists coincide in that they belong to the clade Pantestudines, which groups all those species more closely related to turtles than to any other animal. A group of reptiles that are also found inside the pantestudines are the sauropterygians like plesiosaurs and placodonts. Reconstruction by Dmitry Bogdanov of the sauropterygian Plesiosaurus, a distant relative of turtles. A shell made up of two parts: the upper shell (carapace) which comes from the fusion of the vertebrae and the dorsal ribs and the lower shell (plastron) that originates from ventral ribs called “gastralia” (still present in some current reptiles). While the rest of vertebrates present the scapula over their ribs, the turtle’s ribs (their carapace) cover the scapula. The ability to hide their heads and limbs in their shells. The absence of teeth; having instead horny ridges in their jaws. As we’ll see, these characteristics were acquired very gradually. The carapace of a dead turtle, in which we can see how the ribs fuse with the vertebrae to form the shell. Photo by Fritz Flohr Reynolds. Even if their relationship with turtles isn’t still very clear, Eunotosaurus africanus is the most ancient candidate to being a turtle’s relative. Eunotosaurus was a fossorial animal that lived 260 million years ago in South Africa. This animal had very wide dorsal ribs which contacted each other, which is thought to have served as an anchoring point for powerful leg muscles, used while digging. Also, similarly to current turtles, Eunotosaurus had lost the intercostal muscles and presented a reorganization of the respiratory musculature. Fossil of Eunotosaurus, in which the characteristically wide ribs can be seen. Photo by Flowcomm. The oldest indisputable relative of turtles is Pappochelys rosiane from Germany (240 million years ago). The name “Pappochelys” literally means “grandfather turtle” as, before the discovery of Eunotosaurus it was the oldest turtle relative. Just like Eunotosaurus, it presented wide dorsal ribs in contact with each other. Also, its ventral ribs were already wider and thicker and its scapular girdle was placed below the dorsal ribs. Drawing by Rainer Schoch of the skeleton of Pappochelys in which we can see some of its characteristics. It is believed that Pappochelys was a semiaquatic animal that swam with the aid of its long tail. The next step in the evolution of turtles is found 220 million years ago, during the late Triassic in China. Its name is Odontochely semitestacea, which means “toothed turtle with half a shell”. This name is due to the fact that, unlike true turtles, Odontochelys still had a mouth full of teeth and it only presented the lower half of the shell, the plastron. Even if it also had thick dorsal ribs, only paleontological proofs of the plastron have been found. Odontochelys was discovered in freshwater deposits, leads us to believe that at first it only developed the plastron to protect itself from predators attacking from below. Reconstruction by Nobu Tamura of Odontochelys semitestacea. It’s not considered to be a true turtle due to the fact that it only had half a shell. The first testudine known to possess a complete shell is Proganochelys quenstedti from the Triassic period, 210 million years ago. It already presented many characteristics found in current turtles: the shell was completely formed, with carapace and plastron, its skull was anapsid looking and it had no teeth. However, Proganochelys wasn’t able to retract its head and legs inside its shell (even if this may be because of the horns it had). It also presented two extra shell pieces at both sides, which probably served to protect its legs. Reconstruction of Proganochelys from the Museum am Lowentor of Stuttgart. Photo by Ghedoghedo. Suborder Pleurodira: This suborder is the smallest one as it only contains three current families, all native from the southern hemisphere. The main characteristic is the form in which they retract their neck laterally inside their shell, which leaves the neck exposed and makes the cervical vertebrae present a characteristic shape (Pleurodira roughly means “side neck”). Also, pleurodirans present 13 scutes in their plastrons. Photo by Ian Sutton of an eastern long-necked turtle (Chelodina longicollis), a typical pleurodiran. Suborder Cryptodira: Cryptodirans comprise most turtles. While pleurodirans only include freshwater species (as the testudines common ancestor is thought to be), criptodirans include freshwater terrapins, terrestrial tortoises and sea turtles. Apart from only presenting between 11 and 12 scutes in their plastrons, their principal characteristic is the ability to retract their neck and to hide their heads completely in their shell (Cryptodira roughly means “hidden neck”). Cryptodirans are found in practically all the continents and oceans (except in the coldest habitats). Photo of an Alabama red-bellied turtle (Pseudemys alabamensis) by the U.S. Fish and Wildlife Service. In this photo we can see how cryptodirans hide their heads. Even if there still are some questions to be answered about the evolution of turtles, we hope that with this little introduction to some of the most characteristic fossil “turtles”, you have had an overall view about how turtles got their shells. Whatever their origins are, we hope that the apparition of men isn’t what puts an end to the history of this group of slow but steady creatures. 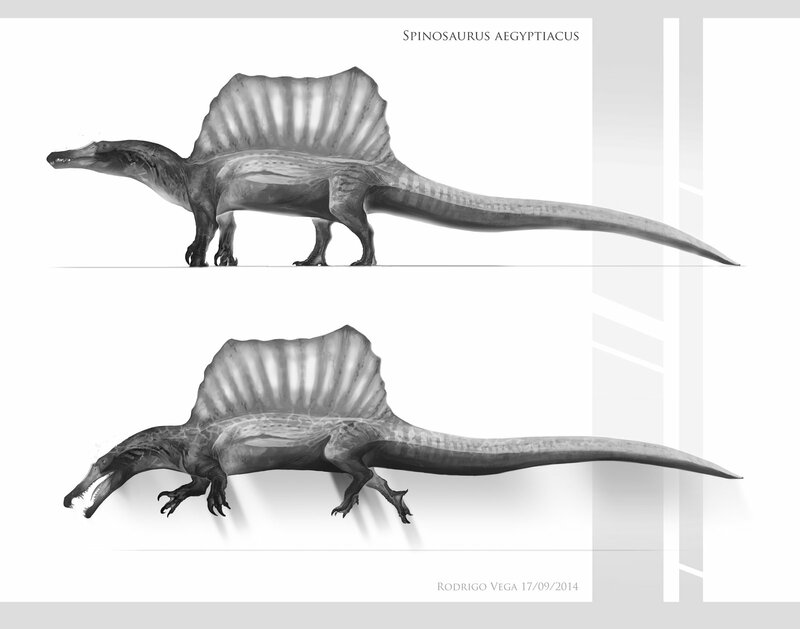 Spinosaurus: the first aquatic dinosaur? Recently, the BBC documentary series “Planet Dinosaur” has premiered on TVE2. In this series the latest paleontological discoveries concerning the biology of dinosaurs are explained. On my last entry we talked about the theropod dinosaurs, one of which is the spinosaur, one of the largest predators that have ever existed. On this entry I’m going to explain some of the facts that paleontology has revealed about the lifestyle of this creature. The spinosaur (scientific name Spinosaurus aegyptiacus) belonged to the Spinosauridae family, a group of specialized theropods which appeared during the late Jurassic and became extinct about 93 million years ago during the late Cretaceous. This group was characterized by being relatively large theropods, with conic teeth and long snouts similar to crocodiles, and elongated neural spines through its back forming a sail-like structure (that’s where the name “Spinosauridae“ comes from, meaning spine reptiles). Comparition of the different sizes of various spinosaurids by Scott Hartman. From right to left: Irritator challengeri, Baryonyx walkeri, Suchomimus tenerensis and Spinosaurus aegyptiacus. Some of the more famous members on this family are, the Baryonyx from Europe, which had long curved claws on its hands to capture the fish it fed on, similar to its close relative the Suchomimus from northern Africa. Furthermore, there was the smaller Irritator of about 3 metres tall found in Brasil and finally, the Spinosaurus from northern Africa, which measuring between 12 and 18 metres long and wheighing between 7 and 20 tons, was one of the biggest predators to ever walk on land. The genus Spinosaurus was distributed in the zone of what is now the north of Africa. This genus lived during the Cretaceous, appearing about 112 million years ago and disappearing about 97 million years ago. Map of the World 94 million years ago by Joshua Doubek, during the middle Cretaceous period. During that period, the northern part of Africa was a very humid zone with high temperatures and lots of wetlands. Spinosaurs probably lived in areas with large rivers and mangrove forests next to the sea, where tidal movements flooded its habitat during certain seasons of the year. This is in accordance with the vision that spinosaurids preferred wet semiaquatic habitats with plenty of great fish to prey upon. Reconstruction from 2010 of Spinosaurus aegyptiacus by Dmitry Bogdanov. Currently there are two possible spinosaur species. 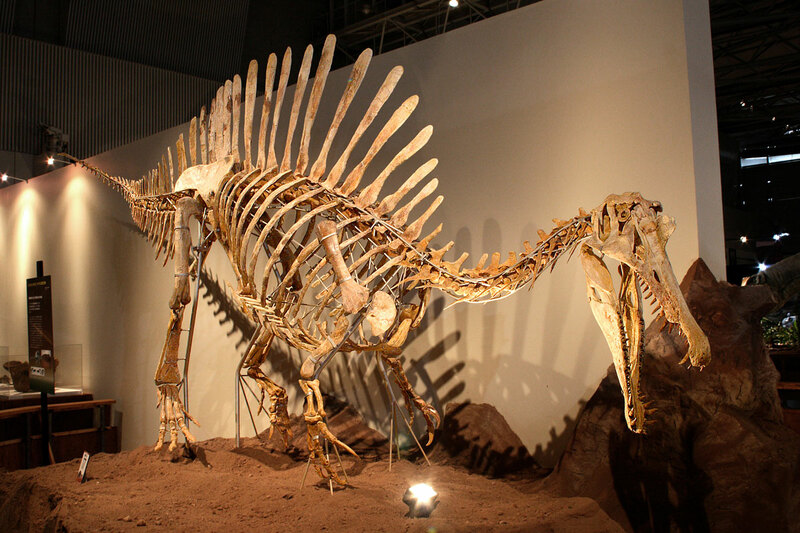 The most famous is Spinosaurus aegyptiacus from Egypt, the species of which we have more information. 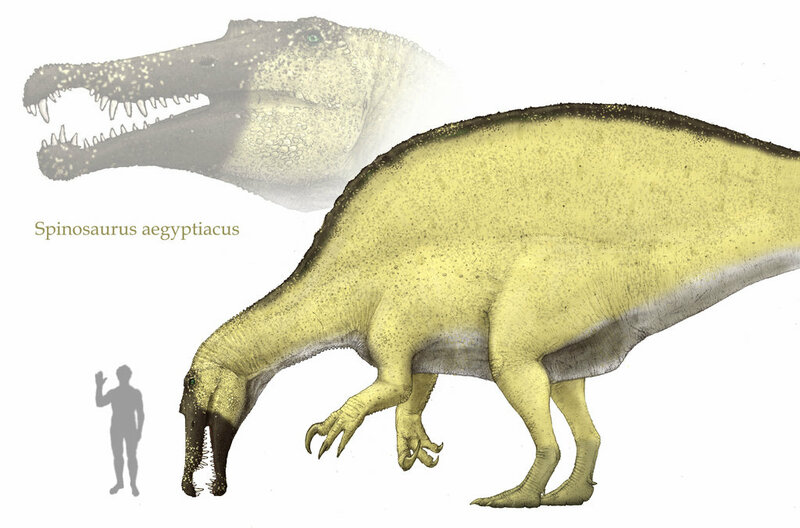 A possible second species is Spinosaurus maroccanus from Morocco, which some authors consider simply as a subpopulation of Spinosaurus aegyptiacus. 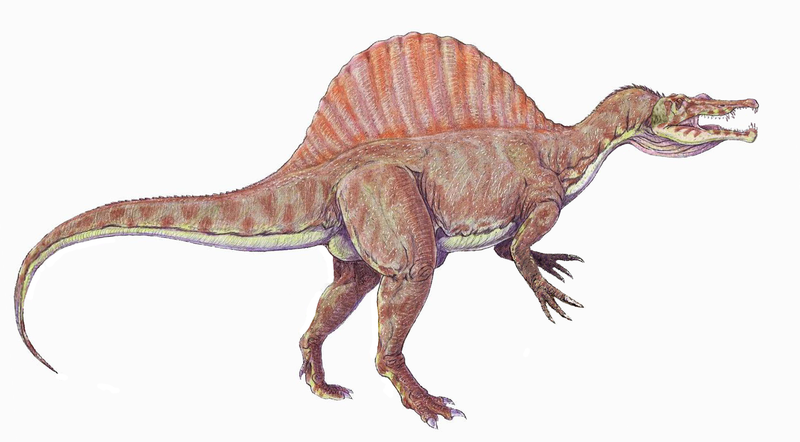 Spinosaurs were discovered in 1912 from a fossil which included its characteristic dorsal spines. These spines grow up to a length ten times that of the vertebra from which they emerged. The scarcity of spinosaur fossils means that the function of the spines is still a mystery for science, although there are some hypothesis. One of these is that the spines formed a “sail” along the back of the animal which was highly irrigated and helped the animal’s thermoregulation, as such a big animal probably would have had problems losing heat. Therefore its sail would have helped the spinosaur to evade overheating, orienting it towards fresh winds to cool down. Reconstruction of the skeleton of a subadult spinosaur (Japan Museum, photo by Kabacchi). Another hypothesis tells us that the spines held a hump-like structure similar to that of camels, which the animal would have used as a fat reserve system to store fat to withstand periods with little available feeding resources. Lots of paleontologists think that both hypothesis could be correct and that the spinosaur used the sail both to regulate its body temperature and also to store fat to resist periods of low prey abundance. It is also possible that the sail made the spinosaur appear bigger than it actually was and that they used it during mating rituals similar to those of the modern peacock. The Spinosaurus‘s skull shows adaptions to a piscivorous diet. The snout is longer and slender than on other theropods. Aside from this, observing the snout of Spinosaurus it has been seen that it presents a series of little holes similar to those found on crocodiles. It is thought that these structures indicate the presence of pressure receptors which helped them detect the movement of their preys underwater. Upper jaw of Spinosaurus from the Museo di Storio Naturale di Milano, where the holes which possibly contained the pressure receptors can be seen. While the teeth of most carnivorous theropods where curved and serrated on their posterior part to tear flesh, spinosaur teeth were conic in shape and had no serration, more similar to those of crocodiles. These teeth were more useful for catching and holding fast and slippery prey and to prevent them from escaping (for example, a fish). Also, various Spinosaurus fossils have been found to have between their theeth scales and bones of large prehistoric fish which probably populated many rivers during the Cretaceous period. Reconstruction by Joschua Knüppe of two Mawsonia species, the rests of which have been found between the teeth of Spinosaurus. Nevertheless, it is generally believed that the spinosaur was probably an opportunistic predator, feeding mainly on fish, also hunting small dinosaurs when it had the opportunity and stealing prey from smaller predators using its great size to intimidate them. Spinosaurs have traditionally been represented as bipedal animals, as most similarly-sized theropods have. Eventhough most fossils are actually pretty incomplete, it is known that its forelegs were more developed than in most theropods, having long curved claws. Traditionally it was thought that Spinosaurus hunted in a manner similar to a grey heron, roaming through zones of shallow water, sinking its long snout underwater to detect prey using the pressure receptors, and catching fish with its jaws. It then, probably used its front legs as hands to tear its prey to small pieces easy to swallow. Reconstruction by Joschua Knüppe of Spinosaurus aegyptiacus in hunting posture. At the end of 2014 a new Spinosaurus fossil was discovered which has changed the view we had on this animal. For the first time, scientists found a fossil which shows the structure of the hind legs of this dinosaur and they have observed a number of characteristics not found in any other theropod not even in other spinosaurids. This fossil shows that the hind legs of Spinosaurus were much more massive than those of other theropod dinosaurs, in which the bones are usually hollow to make them more agile (like present day birds). Also, in this fossil the hind legs are actually much shorter in relation to the size of the animal than in any other theropod, leading some scientists to think that Spinosaurus was actually a quadrupedal animal. This has made some paleontologist think that maybe the lifestyle of the spinosaurs was much more similar to that of a crocodile and that they spent much more time living in water than on land, making the Spinosaurus the first known aquatic dinosaur. Reconstruction by Rodrigo Vega of Spinosaurus based on the skeleton found in 2014. Anyway, many paleontologists argue that the biology of a species cannot be based on a single fossil and advise caution when generalizing to the whole species (the fossil could belong to an adult and a juvenile that died together or could even come from an individual which had suffered some kind of embryonic malformation that kept its legs from developing normally). Paleontology is a science in which with every new discovery we can unravel the tree of life and the evolution of the different groups of living beings. With a little of luck, future discoveries will enable us to clarify the anatomy of Spinosaurus aegyptiacus and define the lifestyle of such a unique and extraordinary reptile. If you enjoyed this article, please share it on social networks to spread it. The aim of the blog, after all, is to spread science and reach as many people as possible. The kingdom of the reptiles: what is a dinosaur? Dinosaurs (superorder Dinosauria, “terrible reptiles”) are a group of reptiles which dominated all terrestrial ecosystems during the Mesozoic (Secondary Era or “the Age of Reptiles”). Even today, to most people there’s still some confusion over what a dinosaur is and what is not, and the term “dinosaur” is often used to refer to all the reptiles that evolved during the Secondary Era. In this entry I’ll try to give account of some of the different groups of reptiles that appeared during the Mesozoic and I’ll explain the classification of the different dinosaurian groups and some of their adaptations. 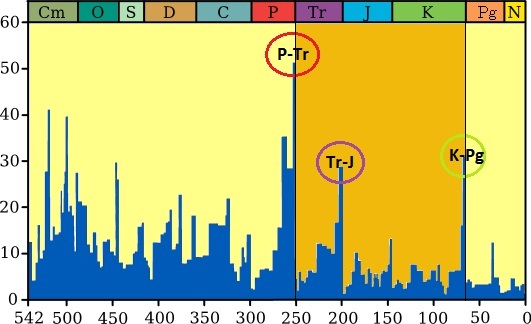 The rise of the dinosaurs was possible thanks to a mass extinction phenomenon which occurred 251 million years ago (Permian-Triassic extinction event). That phenomenon annihilated up to 96% of marine species and up to 70% of terrestrial species in that time, leaving lots of empty ecological niches to be inherited by new animal species. 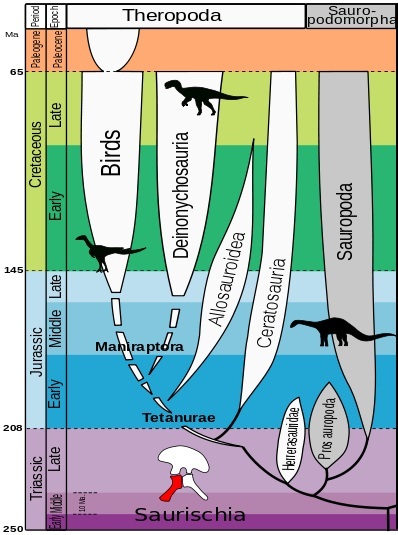 Modified graphic from Rohde & Muller (2005) showing the great massive extinction. 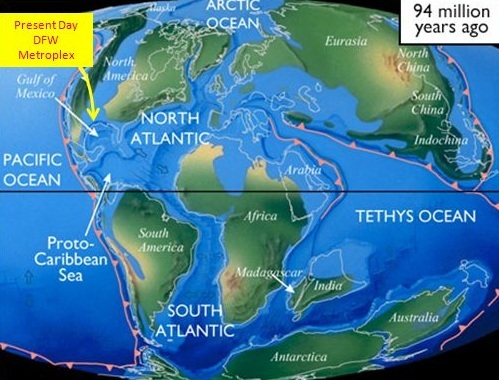 The darker zone corresponds to the Mesozoic period. During the Triassic period (in the early Mesozoic) many different groups of reptiles evolved. One of these groups was the Dinosauria, which at that moment was far from being the dominant group of terrestrial animals. 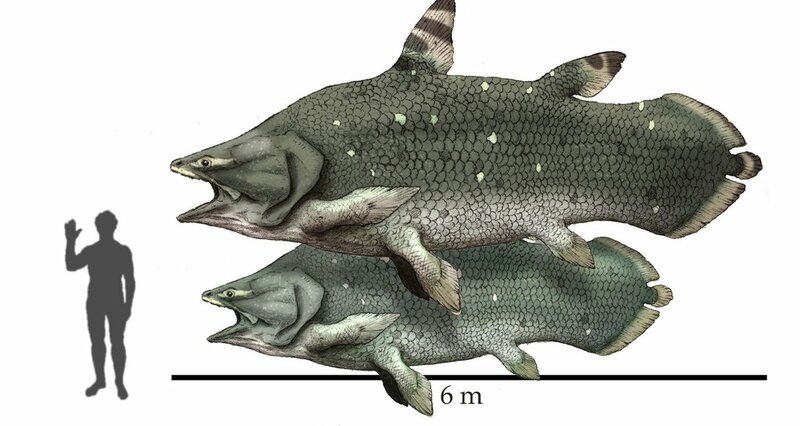 Some other reptilian groups of that time were the terrestrial rauisuchians (clade Rauisuchia) and fully aquatic groups like the sauropterygians (superorder Sauropterygia) and the ichthyopterygians (superorder Ichthyopterygia). 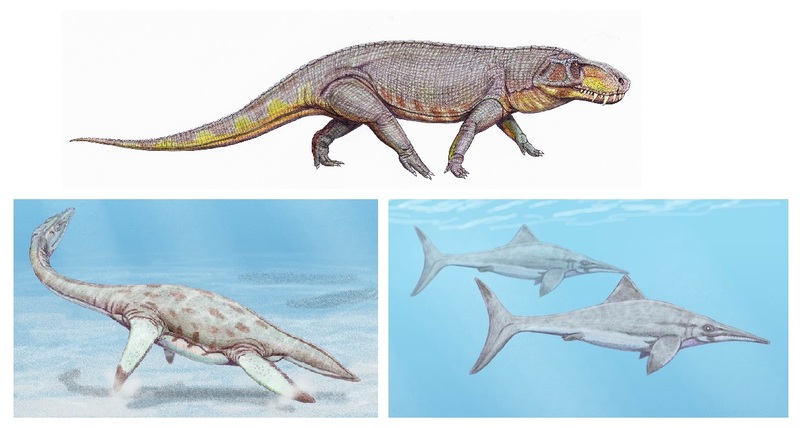 Reconstructions by Dmitry Bogdanov of Prestosuchus (a rauisuchian, top), Nichollsia (a suropterygian, left bottom) and Platypterigius (an ichthyopterygian, right bottom). A second mass extinction in the late Triassic and the early Jurassic put an end to most of the dominant reptile groups, allowing the yet small dinosaurs to expand and evolve, along with some new groups like the crocodilomorphs (superorder Crocodylomorpha, ancestors of crocodilians), the flying pterosaurs (order Pterosauria). Reconstructions by Dmitry Bogdanov of Dakosaurus (a crocodilomorph, top) and Scaphognathus (a pterosauria, bottom). As we can see, dinosaurs are only one of many reptile groups that evolved during the Mesozoic. During the Jurassic period, dinosaurs diversified into many different groups, but they were mostly restricted to terrestrial ecosystems, which they would rule until their practical extinction 65 million years ago at the end of the Cretacic period. The first dinosaurs evolved around 231 million years ago during the mid-Triassic period. They were small in size and were characterized by their limb’s posture, which contrary to most reptiles, grew vertically elevating their body from the ground. That gave them more agility and a more active lifestyle. Top: Skeleton of Eoraptor, one of the oldest known dinosaurs (Museum of Japan, photo by Kentaro Ohno). 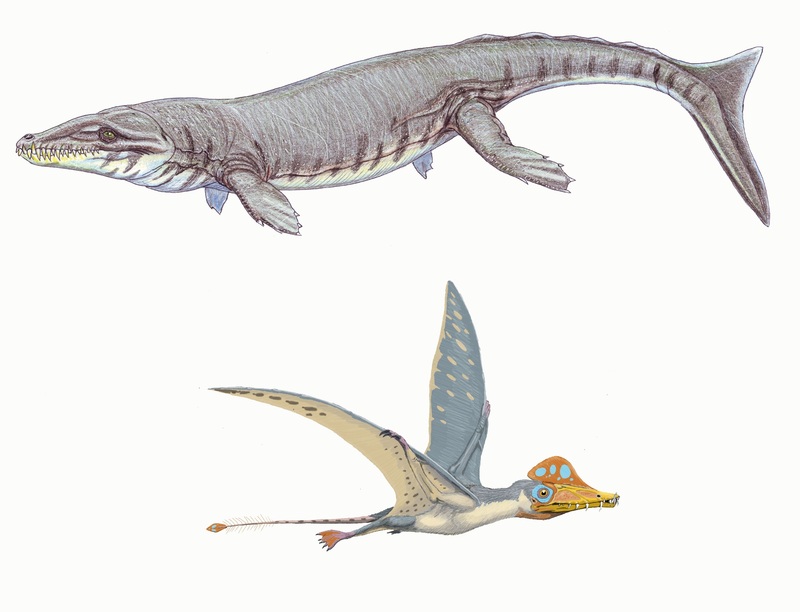 Bottom: Representation of the posture common among most reptiles (left) and the posture characteristic of dinosaurs (right). Then dinosaurs diverged into two different orders: the Saurischia and the Ornithischia. These two groups were distinguished by the structure of their pelvis; saurischians conserved a pelvis more closely similar to that of the other reptiles, while the ornithischians evolved a pelvis superficially similar to that of modern birds. Representation showing the structure of saurischian hips (left) and ornitischian hips (right). The animals represented are facing left. Evolutionary tree of Ornithischia, modified by Zureks. Ornithopoda (“bird feet”): Ornithopods were the most diverse group of Ornithischia, characterized by their three-toed feet similar to that of birds. They were herbivores that could combine bipedal and quadruped walking. Among them we can find the Iguanodon, one of the first dinosaurs to be discovered by science. Iguanodon feet (right) and reconstruction by O. C. Marsh (1896). Ornithopods acquired many different adaptations; some groups had duck-like bills to feed on aquatic vegetation, others developed specialized hands with a sharp thumb and an opposable little finger to grasp the plants they fed on. Many groups developed bony crests which are thought to be used both for species identification and for communication between members of the same species. Reconstruction of Parasaurolophus (missing author), an ornithopod which presented a big hollow crest to amplify the sounds it made. Pachycephalosaurians (suborder Pachycephalosauria, “thick-headed reptiles”) were bipeds which had an extremely thick skull and a series of lateral osteoderms (keratin-covered ossifications) flanking it. It is believed that pachycephalosaurians resolved territorial fights and disputed reproductive rights via head-ramming, similar to goats. Reconstruction of Pachycephalosaurus by Jordan Mallon. The other members of the group are the ceratopsians (suborder Ceratopsia, “horned faces”), quadrupeds which presented; neck frills making their skulls look bigger and the “rostral bone”, which formed a beak-shaped structure on the mouth. Lots of species also developed facial horns which could protrude from the cheek-bone, the eyebrow or the neck frill. Reconstruction of Rubeosaurus by Lukas Panzarin (left) and skull of Triceratops (right), photo by Zachi Evenor. Stegosaurians (suborder Stegosauria, “roofed reptiles”) were big herbivorous dinosaurs characterized by having two rows of dorsal osteoderms from the neck to the tail, which served as protection and helped them in their thermoregulation. Some species also developed caudal spines called “thagomizers” used as weapons to defend themselves from predators. Mounted “thagomizer” at Denver Museum of Nature and Science (left) and reconstruction of Stegosaurus by Nobu Tamura (right). Anchylosaurians (suborder Ankylosauria, “fused reptiles”) developed heavy bony armours that covered most of the body. Some of them, like the Ankylosaurus, developed big bony clubs at the end of the tail to fend off predators. 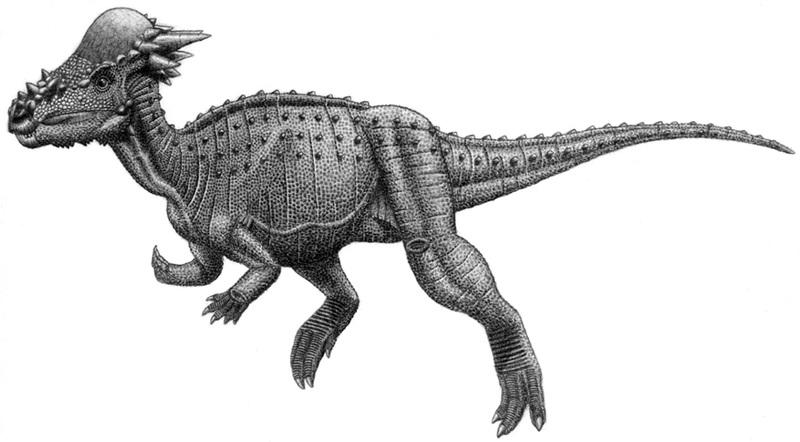 Reconstruction of Euoplocephalus by Nobu Tamura. Evolutionary tree of Saurischia, modified by Zureks. Sauropodomorpha (“reptile-shaped feet”): The sauropodomorphs are better known as the “long-necked dinosaurs”. That’s because they adapted to feed on the highest strata of vegetation. 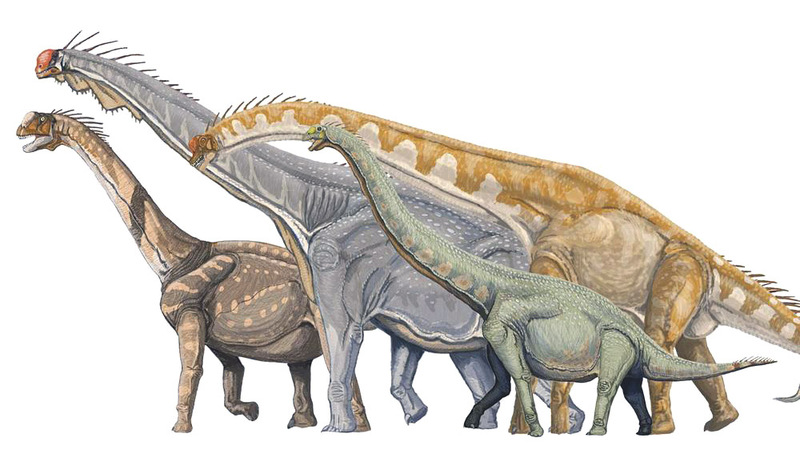 Reconstruction of different sauropodomorphs (left to right): Camarasaurus, Brachiosaurus, Giraffatitan and Euhelopus. Most species became large quadrupeds, with pillar-like legs similar to those of elephants and long necks to reach the leaves of the highest trees. Later species reached tremendous sizes, like the Amphicoelias which could grow up to 60 metres long. Theropoda (“beast feet”): This last group is mostly known for two reasons. First of all is that this group includes some taxons of great predators like the Tyrannosauridae and Dromeosauridae families. The second reason is that theropods are the only dinosaurian group that includes living species, because modern birds are included in the suborder Theropoda. 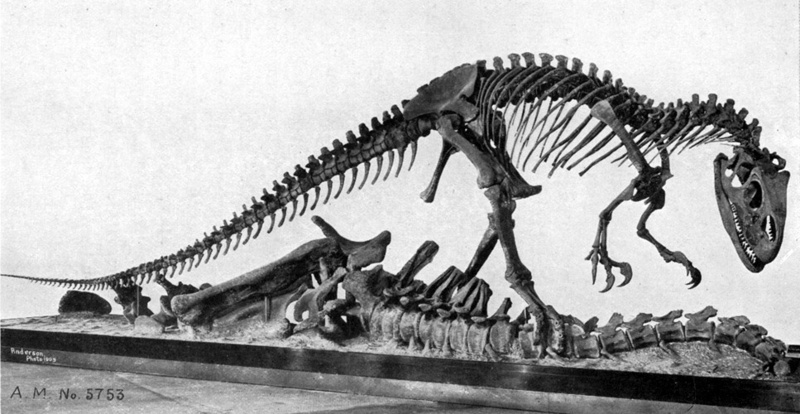 Skeleton of Allosaurus from american museum collections (1915). All theropods are bipedal and most of the Mesozoic species were carnivorous, with sharp replaceable teeth adapted to predation. Theropods present a saurischian pelvis but later on, birds evolved a hip structure more similar to that found in ornitischian dinosaurs. Reconstruction by Davide Bonnadonna of the different clades that led to the aparition of birds (left to right): Neotheropoda, Tetanurae, Coelurosauria, Paraves and finally the Archaeopteryx, believed to be the first bird species that ever existed. Some species had feathers to help thermoregulation. Birds from these groups evolved at the end of the Jurassic period.